Foundation X is a hardware set to match the quality of SJC’s highly regarded bespoke drum sets. Slight issue with cymbal tilter. SJC has built a strong reputation for custom drums since the company was started in 2000 by Scott-James and Mike Ciprari. Now the company follows up with three Foundation series of branded hardware, stands and pedals. There’s the lighter-weight Shadow line in black plate, the flat-based Flatline and the X series, which is the heavyweight touring tackle we’re testing this month. 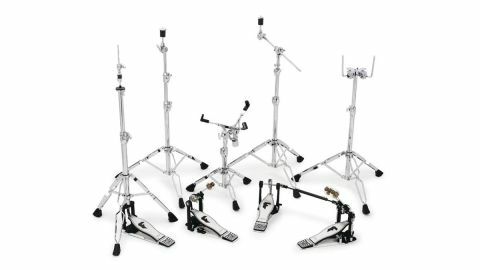 There’s the usual straight and boom cymbal stands, snare stand, hi-hat and (single and double) bass drum pedals, and a double tom mount stand. A five-piece pack (with single bass pedal) saves a useful amount as compared with buying each item singly. It’s hard to tell from pictures how substantial a hardware series really is. Well, the Foundation X Series is properly heavy and it’s evident straightaway that it’s built for intensive gigging. The double-braced tripods are 2mm thick steel. Bottom tubes are 1¼" diameter and upper tubes are 1" (lighter stand series often have 1" bottom sections). We’re in the area of traps cases that take two burly bods to carry. For height adjustment the cast section blocks are sweetly curved and sport the smart SJC logo. And just to make doubly sure, they are surmounted by slot-in, hinged memory locks. But there’s more. Beneath each tripod apex there’s yet another memory lock - the days of sinking stands seem a distant memory. Perhaps the coolest design touch is the oval wing nuts, which have white plastic, logo’ed inserts. Apart from them feeling comfortable, they give the whole series a distinctive look and a modern slant. Operation is straightforward. The only problem encountered was with the cymbal tilter, so let’s deal with that first. It’s not gearless, but is fine-toothed. And the teeth were somehow catching, making it a struggle to rotate - not something you normally encounter. Possibly a teething problem? Other than that, it’s plain-sailing. The stand tripods are furnished with big rubber feet that have curved bottoms for stability on uneven surfaces. Set to its full height the straight cymbal stand is around 155cm, or 5'1" in old money. The formidable tripod legs are 19" long. Again, the sheer weight of all that highly polished, chromed steel is reassuring. Thus the snare stand and double tom stand - items that can easily topple when not so bulky - feel stable. The snare stand has an omni-ball clamp for easy positioning and SJC has added another memory lock on the rod connecting ball and basket, so there is no danger of it rotating your snare into your lap mid solo. Single and double bass pedals have direct drive double chains over a circular cam. Brushed silver, monogrammed ‘F’ footplates and hinged heel plates afford plenty of room - even for those with big feet. All the usual adjustments of angle, tension and stroke, etc, are easy to tweak using the small tool kit (fixed on the base-plate) of drum key wrench and hex keys. As with the majority of pedals (Sonor’s SP4000 being an exception) the beaters do not hit the batter head flat-on. The stroke rotates just beyond vertical before reaching the head. It’s not something that you notice though, as the beaters have curved profiles and thus always make true contact with the head. There are four beater head tonal possibilities afforded by the round and oval felt and plastic profiles. With the well-balanced double pedal the left beater strikes marginally off-centre. However, by employing the supplied hex key the right beater can be moved over a fraction so that both beaters hit either side of centre for balance. Reassuringly hefty, the hi-hat pedal has a great feeling direct-pull chain drive, which simply glides. There is a spring adjustment nut with ‘left loose’ and ‘right tight’ adjustments that is locked by a drum key nut. The pedal board can be swivelled through 60° to clear a space for any secondary pedal you might want to snuggle inside the tripod base. Mind you, that is after the Battle of the Velcro. The white base plate has a generous helping of Velcro plastered beneath and we’re in two minds about this. When Velcro grips like life depends on it you can’t fine-position your pedal because once plonked down it requires an almighty struggle to shift. Top hi-hat cymbals working loose is a well-known, occupational hazard, but the Foundation X clutch is designed to eliminate any such calamity. The clutch has a jaw-clamp, while the actual cymbal felts are supported by a drum key locking mini-block, which again is rigid once tightened. Even the bottom cymbal tilter has a locking nut, so once your angle is chosen it’s fixed with no fear of any on-stage disaster.